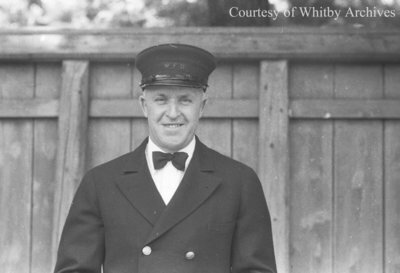 A black and white negative of Russell (Russ) Loyde Bell in his Whitby Volunteer Fire Brigade uniform. In the background is a wooden fence. Russell (Russ) Loyde Bell was born on 19 May 1893 to Donald and Martha Bell. Russell married Neta Gladys Newton (1893-1982) on 29 January 1913 in Lindsay, Ontario. They had one son, Donald Louis Bell. He was a member of the Whitby Volunteer Fire Brigade. Russell owned and operated Bell’s Garage with his son Donald from 1932 until he retired in 1972. The garage was located at 130 Dundas Street West until 1942. In 1942 Bell’s Garage was moved to a location at 211 Dundas Street East. Russell died on 25 October 1977 in Whitby, Ontario. He is buried in Mount Lawn Cemetery, Whitby, Ontario. Russell Bell, July 22, 1939, Marjorie Ruddy. Whitby Archives A2013_040_778A.